Latin America has often been scorned by U.S. researchers as a place that produces highly colorful and unverifiable accounts of UFO sightings, with the attendant phenomena of occupants, monsters, submarine bases, etcetera. While it is true that once upon a time the line between the metaphysical and the entirely physical tended to get blurred, there can be no doubt that many of the objects seen streaking across the southern skies are in fact, not quite so alien. With "kind space brothers" of the Adamskian mold consigned to the attic of history, and the ETH in retreat, ovnílogos have turned their attention to a possibility that always lurked in the back of everyone's mind: that certain types of UFO phenomena could be a lot closer to earth than was previously believed. Daniel Rebisso Giese, the Brazilian author of Vampiros Extraterrestres Na Amazonia, was among the first researchers to look into the 1977 UFO attack on the isolated communities of the Amazon Delta. The book popularized the "Chupa-Chupa", described as rectangular and cylindrical structures capable of firing beams of cohered energy against both animals and humans. Rebisso states that these hostile devices forced the locals to stay home at night, and kept fishermen from heading out to the sea, "since many declared that the objects came out of the depths of the Atlantic Ocean." A number of fanciful theories were juggled about to explain the origin of these solid objects--bona fide alien bloodsuckers, the denizens from an underground empire, a "dying" alien race in need of blood plasma, etc. A possibility that received shorter shrift was that the "chupas" represented the success efforts of Nazi scientists working secretly on an island of the Bay of Marajó since WWII. However, a curious sideline to the "chupa" phenomenon was the presence of a foreigner, an unnamed young woman, who would purchase vast amounts of fish at the market in Bragança. No one knew where she lived or who she was, or what she did with her considerable amount of "groceries," but evidence pointed to her living on Ilha do Cajueiro, an island infamous for its strange phenomena: local fishermen had reported seeing bizarre lights and the shadows of people moving around in the darkness for many years. Word of the "fish girl" and her activities prompted action by Brazil's intelligence apparatus, who feared she might be a gun runner or a spy. When they arrived in force on Cajueiro, all they found was an abandoned cabin and an envelope addressed to "Elisabeth". It was believed that whoever she was, this mysterious foreign woman was somehow involved with the "chupas" operators, if only as far as stocking their larder. The presence of strange humans among the confusion caused by the UFO flap was not limited to Ilha Cajueiro, either. In July 1977, at the height of the "chupa" incidents, the corpses of some dead farmers were found in the vicinity of the municipality of Bequimao. Five hundred cruzeiro notes were found lying beside them. The police associated these unexplained deaths with the presence of three "foreign-looking men, who spent most of the day closeted in a local hotel." The trio would be seen driving around at night in a car of unknown manufacture. Other corpses were found in the area, with curiously punctured dollar bills lying next to the hapless victims. [Spanish author Manuel Carballal mentions a curious parallel to this gruesome activity - in this case allegedly related to the UMMO hoax -- in the controversy surrounding Spain's Baroness Lihory and her strange subterranean "laboratory"]. An extraterrestrial hypothesis was also discarded when Mexican authorities were faced with an "unidentified terrestrial object" seen repeatedly in the not readily accessible reaches of the Sonora Desert, particularly in the enigmatic Zone of Silence . According to reports made by local residents, this ground-based UFO was a brilliant light that would move quietly along the desert surface, somehow skirting or rolling over the cacti and other desert plant life. A number of Mexican UFO researchers voiced an opinion that the strange light could be an American contraption resembling the Soviet Lunakhod moon-rover. A vehicle of this sort, they reasoned, would remain immobile during the hot desert day, recharging its batteries, and roam around at night on its "secret" mission. The real identity of the mysterious light was never established, but it was reminiscent of similar lights seen operating in the Brazil's dense caatinga forests. A UFO allegedly went down over the Mexico's Sierra Madre mountains during the month of February 1967, causing a great deal of consternation on account of the number of sightings which had taken place throughout the country that year. The residents of Villa Del General Terán had heard a number of large explosions while a sphere descended toward the ground. When the object was examined by American scientists weeks later, it was determined to be " a manufactured titanium gas stowage sphere form a Titan III-C upper stage." The Titan rocket had placed seven communication satellites in orbit a month earlier. 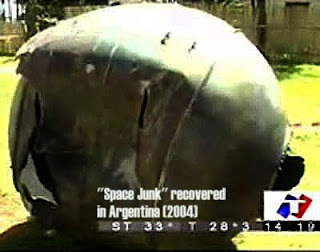 Argentina has also been a favorite UFO port of call since the phenomenon first received attention in the postwar years, and in the heat of intense "flaps", man-made vehicles can sometimes be lumped in with the unknown ones. In 1980, the Argentine media carried a story about an Argentine-born NASA scientist named Fabio Hector Acuña, who notified his mother in Buenos Aires that the "flying saucers" seen over that country were the results of a NASA venture called Project Firewheel. The text of the message read: "On May 23, we will launch a satellite--look up at the sky from June 9th to the 15th around midnight. You will probably only see a flying saucer, but it will have been created by us. The project is called "Firewheel" and it consists of injecting an artificial cloud which will create something like a comet, and that is what you are going to see." If it were ever positively determined that the UFO phenomenon was a purely terrestrial one, involving man-made craft, it probably woudn't cause much of a sensation in many Latin American countries. For a number of years, Dr. Antonio Las Heras, an Argentinian parapsychologist and talk-show personality, has worked hard at demystifying a number of cases that have formed part of the UFO canon for the past thirty years. Las Heras concentrated his efforts on the July 1965 involving the sighting of a UFO over the Antarctic by Chilean, Argentinian and British polar research teams. The allegedly alien craft drove compasses crazy, caused magnetometers to produce wild readings. The official statement made at the time by Cmdr. Mario Jahn of the Chilean fleet stated that "it would be foolish to claim that we saw a flying saucer of the type seen in science fiction shows. What we saw was real--a solid object that moved at a tremendous speed...gave off a greenish light, and caused interference with the electromagnetic devices of the Argentine base next to our own, on Decepción Island." Dr. Las Heras suggests that the Decepción Island UFO of 1965 was, in fact, something much more mundane and by far more perilous: a nuclear-powered or warhead-equipped satellite belonging to one of the superpowers, spinning out of control. The EM effects that upset the delicate instruments could have easily been produced by a disintegrating nuclear reactor, or as a result of the satellite's self-destruct mechanism going into action. The satellite's disintegration in the atmosphere would have given the impression of zig-zagging to any earthbound onlooker. Not to disappoint his readers, Las Heras hastily adds that real UFOs were seen (and photographed) over Decepción two years later, at the height of volcanic eruptions that destroyed the island itself. Las Heras' conclusions cannot be dismissed so easily when we consider that six months after the Antarctic episode, the northern hemisphere faced a similar incident in the woods of Pennsylvania. The non-extraterrestrial hypotheses set forth for the December 1965 crash at Kecksburg, PA are considerable: a Soviet or Chinese satellite, a nuclear device of the sort mentioned earlier, or a U.S. space mission gone awry. Ufologist Stan Gordon, who has devoted decades to the study of the Kecksburg crash, has always taken great care to point out in his research that UFO and ET are not synonymous, particularly during this incident. Dr. James Oberg suggested that the object was recovered under such secrecy on account of its heat shield, which was far in advance of anything we believed the Communist Bloc to be capable of at the time. Landlocked Bolivia, home of the inscrutable Tiahuanaco ruins, has a rather active recent history of UFO sightings and crash/retrievals which have proved to have a decidedly non-extraterrestrial bent. In 1962, the Andean community of Ayo-Ayo became the destination of a "space capsule" which apparently disgorged a puma-like feline. The disoriented space traveler was clubbed to death by the frightened locals, who then sold its pelt to a "Colonel Wymer" of the U.S. Embassy, which apparently took charge of the recovery efforts. Seventeen years later, another UFO crashed on the property of a wealthy landowner in the Andean foothills. A local farmer had allegedly seen "a fireball" streaking across the clear night skies, and accompanied by a friend, reached the impact site, where they found a metal sphere made of some lightweight metal roughly the size of a basketball. This evidence was confiscated by Bolivian soldiers. The Bolivian Army would later release a statement saying that the object was by no means extraterrestrial, merely a fuel cell from a satellite. A video of the recovery effort was presented to the U.S. Embassy in La Paz. These South American incidents bring us ever closer to the role played by the U.S. in recovering space hardware--not our own, in some cases--that has fallen back into the atmosphere. Specialized teams attached to the U.S. Air Force (the Project Moondust and Operation Bluefly of UFO fame) were charged with the mission of beating the particular country's authorities to the site and recovering the artifacts in question. While the possibility that actual extraterrestrial devices have been retrieved should never be discounted, there is a greater likelihood that these teams have recovered film canisters from KH-series spy satellites ("Big Birds") and other sensitive technology that may have survived disintegration upon reentry. Recently declassified State Department documentation (obtained through the repeated filing of FOIA requests by investigator Stan Gordon) indicate that careful tabs are indeed kept on all the hardware hitting the ground in far-off places. A memo sent to the State Department from the American embassy in Buenos Aires in February 1984 dutifully reports the reentry of "what may have been a satellite" 70 kilometers from the town of Ayacucho. The memo also states the size and shape of the object and solicits guidance from Washington in determining if it is indeed a U.S. or Soviet satellite. In this case, the reply to the memo indicates that it appears that the object was not "one of ours" and that "authorities do not know what the identity of the object could be." Across the Atlantic Ocean, Spain has also experienced its share of man-made UFOs amid some of the richest case histories in the study of the phenomenon. Vicente Juan Ballester-Olmos and Juan Fernández Peris's monumental Enciclopedia de los Encuentros Cercanos con OVNIS (Encyclopedia of UFO Close Encounters) carefully points out a listing of cases described as "pseudo-ufo's"--355 cases spanning both Portugal and Spain and whose real explanations lay far from outer space: from meteorites, promotional devices, and weather balloons to a motley assortment of truck tires, marine algae, and in a Barcelona case, the drivers of a Red Cross ambulance. "To account for the thousand and one stimuli that can--and do--deceive the senses, or the processes conductive to imagining UFOs, illustrates the importance of erroneous interpretation to the UFO phenomenon as a whole," declare the authors. However, the catalogue lists 230 cases that correspond to bona fide unknown phenomena of possible nonterrestrial origin.